Khushi Patel is part of the clinical trial. An Indian American first-grader, Khushi Patel, 7, of Huntsville, Alabama, who was suffering from cancer, has been treated with a new type of immunotherapy developed in St. Jude laboratories to treat patients with neuroblastoma, a cancer of the sympathetic nervous system that’s especially dangerous to kids. “She’s fine now,” said mom Vaishali Patel, 31, as she watched her daughter in a play room at St. Jude’s Children’s Research Hospital, reported The commercial Appeal. In a clinical trial in which Khushi Patel is participating, an experimental antibody specially engineered to trigger the body’s immune system to fight cancer has helped shrink tumors — some dramatically — in 80 percent of newly diagnosed high-risk patients. Preliminary findings from the study were presented last week at the American Society of Clinical Oncology annual meeting in Chicago. “The early response is very promising, among the best that we have seen against neuroblastoma, but we still have a long way to go,” said the study’s first author, Dr. Wayne Furman, a member of the St. Jude department of oncology, in a prepared statement. The trial is the first to test the use of a monoclonal antibody — a lab-produced molecule that mimics the antibodies produced by the body so the immune system can attack germs and other invaders — in conjunction with intensive, high-dose chemotherapy at each phase of treatment. Neuroblastoma patients also typically undergo radiation therapy, surgery and stem-cell transplants. One factor that makes cancer so dangerous and insidious is the way it shields itself from recognition by the immune system and avoids attack. But the monoclonal antibody is designed to seek out an antigen called GD2 that is present on neuroblastoma cells, and then mark the cells so the immune system can find and destroy them. St. Jude engineered a mutation into the monoclonal antibody to minimize its side effects, said Dr. Sara Federico, who is in St. Jude’s oncology department and served as co-investigator in the trial. Patients also are given medication to “rev up” the immune system, she said, reported The Commercial Appeal. Of the 34 children and teenagers covered in the report, 13 had completed therapy and showed no evidence of disease, while four others have been off treatment for at least 18 months. An additional 13 patients are still receiving treatment, while two patients with persistent disease underwent further therapy and two others died. Neuroblastoma is diagnosed in about 700 people in the U.S. annually, mostly in children ages 5 years or younger. The most common cancer diagnosed during the first year of life, it typically begins in the very early forms of nerve cells and is found in the adrenal glands above the kidneys. For many patients, including infants, the cure rate is 90 percent or better, but among those whose disease has spread or involves a certain type of mutation, only 50-60 percent survive three years with current, nonexperimental treatment. For the Patels, the diagnosis Khushi received last October — after complaining of chronic stomach pain and showing a loss of appetite — came as a shock. The young girl had a large tumor in her adrenal gland and a couple smaller ones in her liver. “We didn’t know a child could have any other cancer than leukemia or lymphoma,” said dad Chirag Patel, 31, who has a small business in Huntsville. 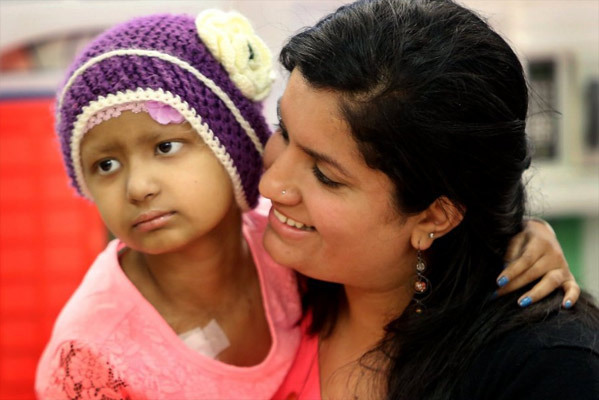 Having undergone chemotherapy, radiation, the stem cell transplant and treatment with the antibody, Khushi is “clear,” her mom said. For the next six months, the family will make trips back to St. Jude every 15 days for more rounds of light chemotherapy and treatment with the antibody. Chirag Patel expressed gratitude that the experimental treatment became available at a time when Khushi could benefit from it. “There is no word to say” to describe the family’s fortune, he said.